Lowering kit for Kawasaki Versys x-250 2017-2018 by Lust Racing. 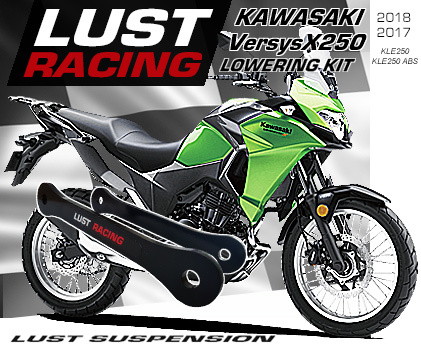 Now you can easily reduce the seat height on your Kawasaki Versys x-250 with a suspension lowering kit from LUST Racing. The suspension links in the lowering kit replace the stock suspension links in the rear shock suspension and reduces the seat height by approximately 40mm / 1.6"in.